The CasaTunes music system includes the CasaTunes music server and one or more CasaTunes 6X6 matrix amplifiers. You can connect up to 6 x CasaTunes 6X6 matrix amplifiers to a CasaTunes music server, for a total of up to 36 rooms. 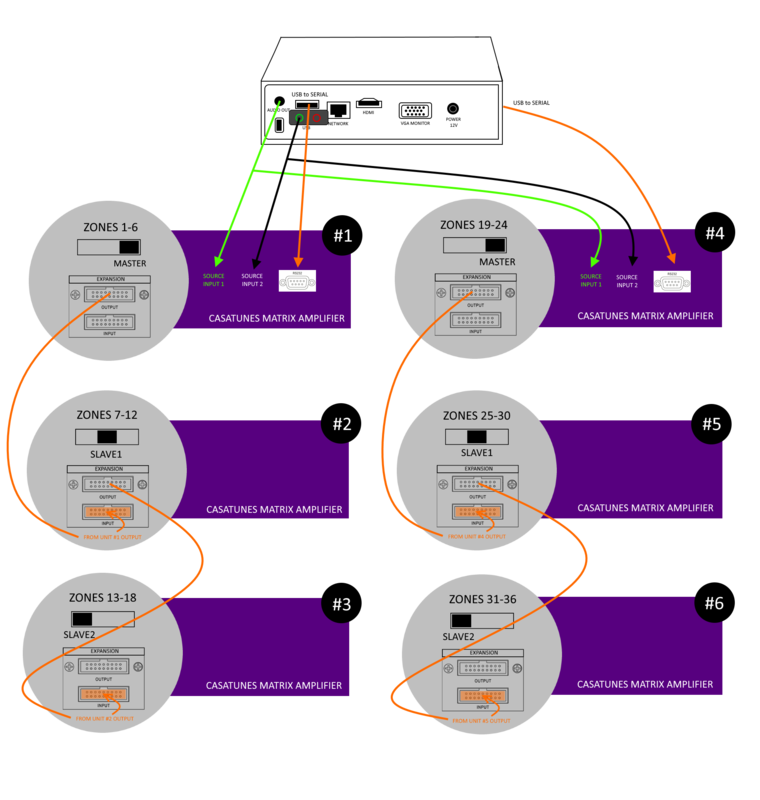 The following diagram provides a brief overview illustrating how to connect the 6 x CasaTunes 6X6 matrix amplifiers to the CasaTunes music server. Make sure your music server and matrix amplifiers are disconnected from power before making any connections. The CasaTunes 6X6 matrix amplifier is controlled by the CasaTunes music server using a serial control protocol (RS-232). Connect the provided USB-to-Serial cable from the top USB port on the music server to the RS-232 port on Unit #1 (CasaTunes 6X6 matrix amplifier). This serial cable is used to control units #1 through #3. The expansion cables used to connect Unit #1 to Unit #2, and Unit #2 to Unit #3 carry the serial cable signals required to control Units #2 & 3. If you purchased a CT4-24Z, CT4-30Z or CT4-36Z, your music server includes an USB-to-Serial cable. Connect this cable on one end, to any of the USB connectors on the music server, and on the other end to the RS-232 connector on Unit #4. This serial cable is used to control units #4 through #6. The expansion cables used to connect Unit #4 to Unit #5, and Unit #5 to Unit #6 carry the serial cable signals required to control Units #5 & 6. Connect the 2 analog outputs from the CasaTunes Music Server (CT-2) to Unit #1. If you purchased a CT2-24Z, CT2-30Z or CT2-36Z, your music server ships with 2 x 3.5 mm to 2 x stereo RCA cables (Y-cables). Use these to connect the 3.5 mm stereo outputs from the music server to the appropriate SOURCE on both matrix amplifiers (Unit #1 and Unit #4). Connect the Expansion Output connector on Unit #1 to the Expansion Input connector on Unit #2. Connect the Expansion Output connector on Unit #2 to the Expansion Input connector on Unit #3. Connect the Expansion Output connector on Unit #4 to the Expansion Input connector on Unit #5. Connect the Expansion Output connector on Unit #5 to the Expansion Input connector on Unit #6. Each CasaTunes 6X6 matrix amplifier is capable of powering a pair of speakers in 6 rooms. Connect your speakers to the Zone Speaker Outputs 1-6 on each matrix amplifier.